Regular professional dental exams and cleanings are necessary, but home dental care is also critical to your pet’s health and wellness. Pet tooth brushing can reduce the need for professional cleanings, and keep tartar and decay at bay. 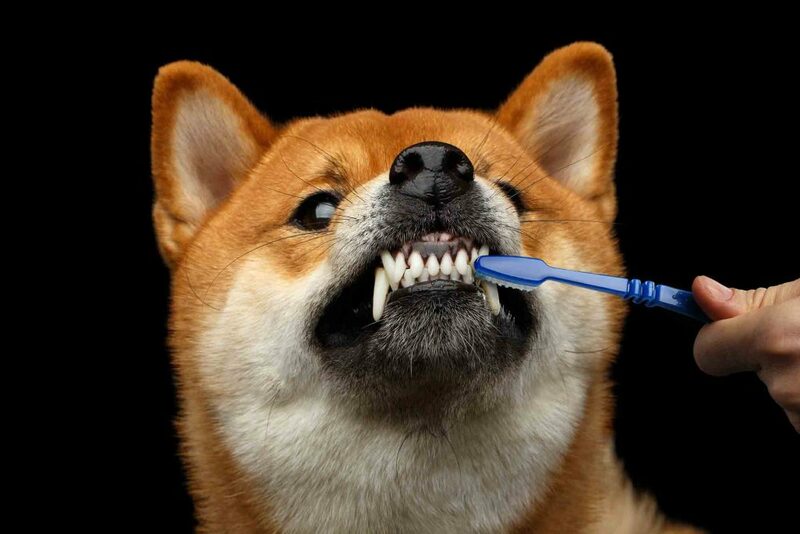 The idea of wielding a toothbrush anywhere near your pet’s mouth may seem impossible, but with patience and persistence, most pets can learn to tolerate (if not enjoy) daily tooth brushing. A pet-specific toothbrush that’s appropriate for the size of your pet’s mouth (a soft pet-specific finger brush can also be used). Pet-specific toothpaste. These come in different flavors, including, poultry, beef, seafood, and vanilla mint. NEVER use human toothpaste as the ingredients are toxic to pets. Treats to use as a reward. Allow your pet to sniff and examine the toothbrush and toothpaste you’ve selected. Get your pet used to having his/her mouth touched by lifting the lips and gently rubbing their teeth and gums with your finger. Gradually introduce a finger covered in toothpaste, then try the toothbrush/toothpaste combo (or finger brush if your pet isn’t tolerating a toothbrush). Start slowly. Stop if your pet becomes agitated. With practice and patience, the agitation should subside as your pet gets used to the process. Aim for a goal of 30 seconds of brushing on the upper and lower teeth, on each side of the mouth. Brush your pet’s teeth gently in a circular motion, making sure to stay along the gumline. You only need to brush the outer surface of the teeth, including the front. Licking and chewing the toothpaste while you’re brushing is normal pet behavior. It is also not unusual for a pet to keep its upper and lower teeth together while being brushed. In this case, gently maneuver the brush around so you can reach all of the teeth. Be sure to reach the brush all the way to the teeth in the back. They can be easy to miss. End each brushing session with praise and a treat to create a positive association for your pet. You can also give the treat prior to brushing, instead of after, to generate excitement for brushing time. Brush once a day, preferably, after your pet’s last meal — this will remove the sticky plaque that has formed during the day. Brushing your pet’s teeth can start at any age. Ideally, it’s best to start when your pet is a puppy or kitten. If your pet is older, after a dental cleaning is also a great time to get started, as the mouth is free of tartar and daily brushing will help keep it that way. Do consider tooth brushing to be a bonding experience with your pet. Approach each session with positivity and understanding, and keep at it! Over time, toothbrushing will become a normal part of your pet care routine, and your efforts will be rewarded with less to no tartar build-up, fresher breath, healthier gums and teeth, and improved wellness for your sweet pet. At Lone Tree Veterinary Medical Center, we take the dental health of our patients seriously. If you notice any signs of a dental problem, such as foul breath, bleeding/swollen gums, or pain while eating, don’t hesitate to contact us. We are here for you and your pet every day. Previous: New Year, New Pet Wellness Resolutions!